The Sunset Sunday Series completed another successful year. The series, introduced one cold wintery day in 2010, has now become a weekly institution here on Stay Adventurous and continues to grow. When I view all the places photographed and all the special stories involved with the 180+ sunsets in the series, I can do nothing but smile. It energizes me for another year, but first let’s look back at 2013. Last year the series went to 6 of the 7 continents. It started the year off with a sunset in Antarctica (thanks to a Sunset Sunday Guest Post) and hit every continent except South America. The series also introduced recap videos, a great way to watch a few months of sunsets in just 90 seconds, and even included some action-adventure video in recent posts such as the Sunset in Punta Mita and the St Regis Sabrage Sunset Celebration. Now, let’s take a look at the Sunset Sunday Video Recap from September to December, 2013. I LOVE the new video, but perhaps the highlight of the year is the Sunset Sunday Calendar. Twelve images were selected to be part of the first Stay Adventurous Travel Photography Calendar and I am happy to report the project was met with a positive response. There is also still time to order your calendar here > The 2014 Sunset Sunday Calendar – Chasing the Sunset. See a complete list of the 2013 sunsets here. Although I did spend ‘mucho tiempo’ in Latin America last year, the Sunset Sunday Series never made it to South America. I often spend my time in Mexico. As you might know, I can’t get enough of the country and even plan to create the first Stay Adventurous tour (StayAdvenTours) to Mexico in 2014. I will include a sunset moment on the tour, of course. Back to South America, you can expect at least five sunsets from the other American continent. Plus, the goal of the series is to become more balanced – more posts from Africa and Europe (only 3 in 2013), less from North America, and enhance the Sunset Sunday Map (the interactive sunset map created in 2012). How? Well, last year the series obtained eleven guest posts. Yes, over 20% of the posts were from other photographers and I expect to reach out further to others willing to share their special moments and sunsets in 2014. If interested, please let me know. Finally, as the series continues to grow, I’ll continue to watch and photograph sunsets in 2014, add videos, and create another calendar for 2015 with a different theme. I also plan to spend many of my sunsets just like one of the last ones I experienced in 2013 – one the beach with some surf. 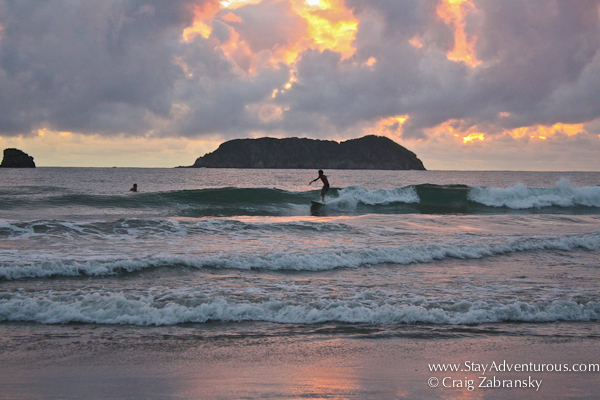 I enjoyed this one in Costa Rica – Pura Vida! Happy New Year and Happy Sunset Sunday. You captured some really beautiful sunsets last year. Love your calendar. Great job. The video says a lot. Be proud of yourself, Craig. Looking forward to another year of sunsets and travel adventures right here at Stay Adventurous. I love the calendar, too. Sunset Sunday is more than a hashtag and a day, it is a way of life. I could see this becoming the next big fad kind of like Jimmy Buffet and Margaritaville. Ted, you are so observant…plus there is a good chance I am heading to Margaritaville for an extended stay… Yes, the Florida Keys are in my future once again. I can’t believe what gorgeous sunsets you’ve captured and how lucky we are that you’ve shared them with us all. Thank you.